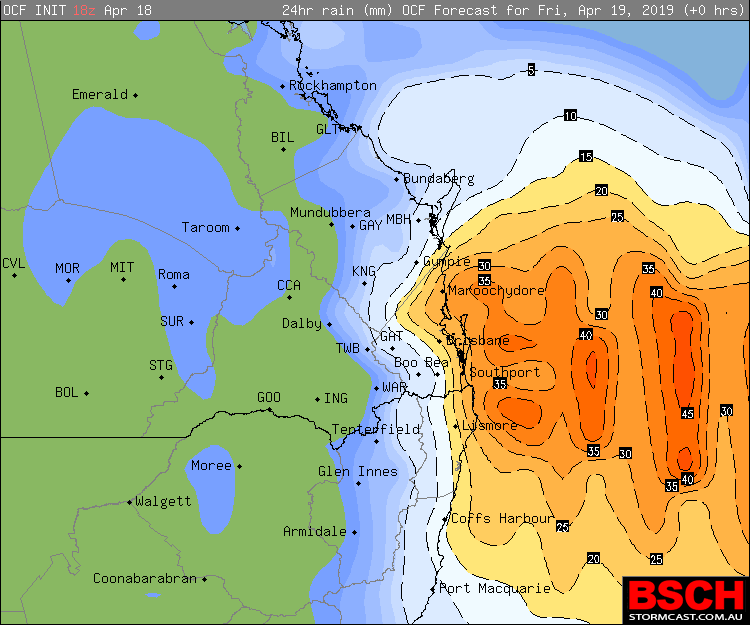 Models are in agreement that like always, South East QLD & North East NSW are expecting a wet Easter for 2019 as showers and rain periods are set to increase from Friday afternoon onwards across both areas, leading to some respectable 5-day totals. 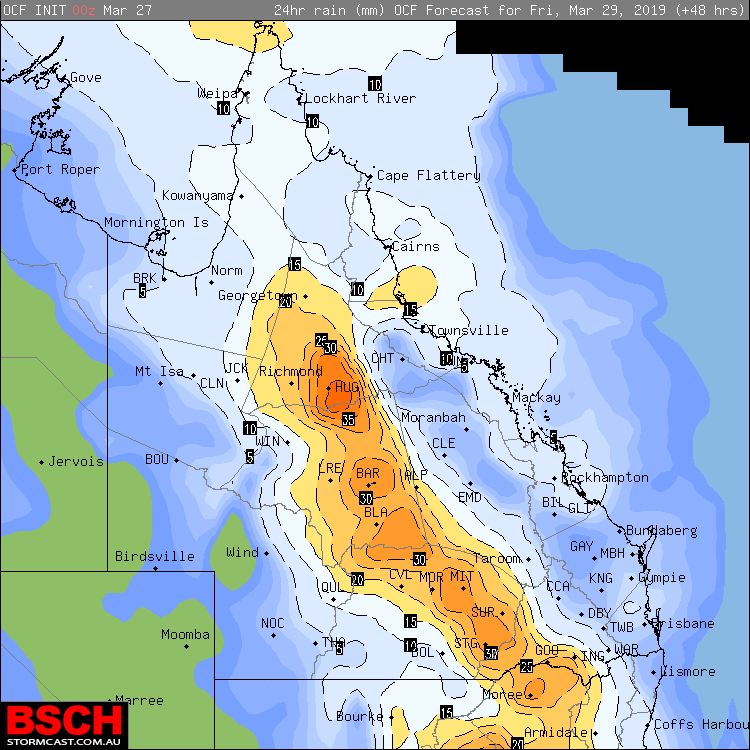 Above image: ECMWF 5-day Rainfall accumulation – orange = 50mm+ (GFS is in agreement). 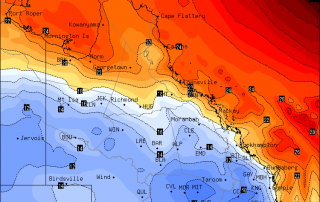 Across the Eastern long weekend, models have come into agreement that starting later on Friday and lasting until at least Tuesday, an onshore flow is expected to deepen across the South East corner of QLD and North East corner of NSW. This onshore flow is likely to combine with some weak upper level support on both Friday and Saturday, before an Inland trough develops on Sunday and lasts until Tuesday to further compliment the system. While its not expected to be a continuous non-stop rain event. Good falls are expected to develop on Friday across both NENSW and SEQLD with Coastal areas may pick up 20-40mm overnight Friday into Saturday. 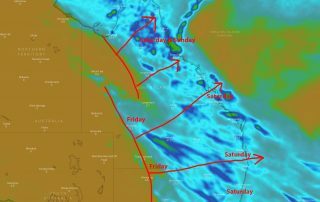 Rain areas should then ease a little on Saturday, although some good falls are still expected over the Sunshine Coast to Hervey Bay region. Sunday is expected to see just some isolated to “maybe” scattered light showers across both areas and these should continue into Monday where less than 10mm is expected for most areas across the 2 days. 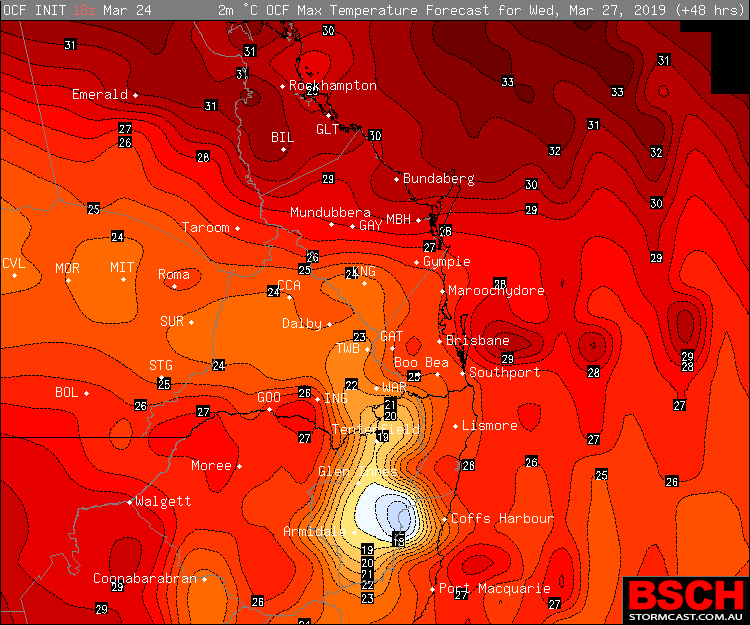 Tuesday is bouncing around a bit, with early indicators showing 50-100mm being possible over the Northern Rivers in NENSW, but that has since backed off to less than 10mm with the better falls of 25mm+ being over the South East QLD region once again (mostly North of Brisbane) – given Tuesday is still 5 days away, this part of the forecast is expected to change around a bit. 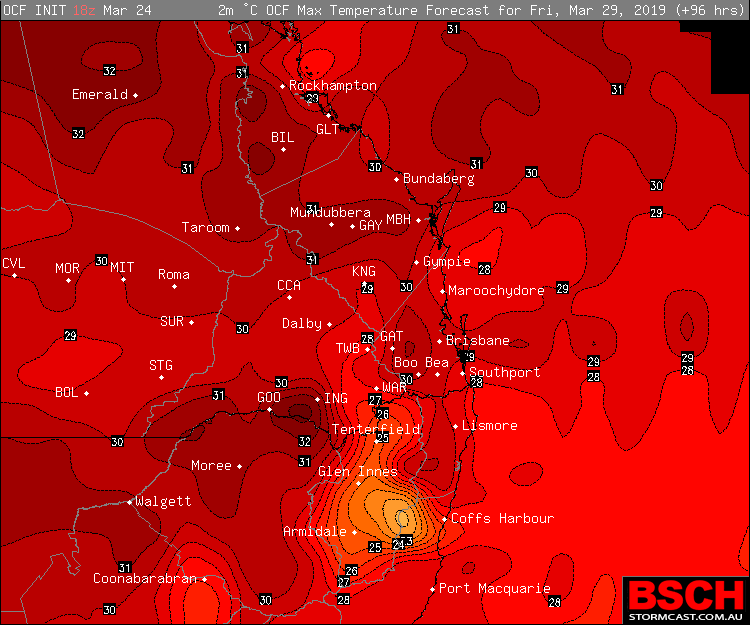 Across the 5 day period though, good falls of 50-80mm are expected across Coastal areas from about Hervey Bay down to Coffs Harbour. 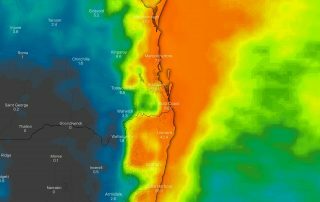 The better falls are likely over the Gympie to North Brisbane area as well as the Gold Coast Border Ranges and immediate surrounding areas. Unfortunately for those West of the Ranges, these good falls are expected to be confined to the Coast. 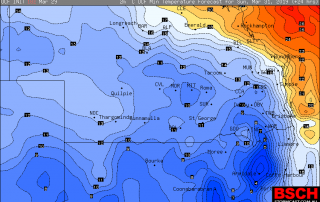 Even Ipswich, Beaudesert, Boonah, Esk and surrounds are only going for 15-20mm across the 5 days. Toowoomba, Warwick, Stanthorpe, Kingaroy even less. 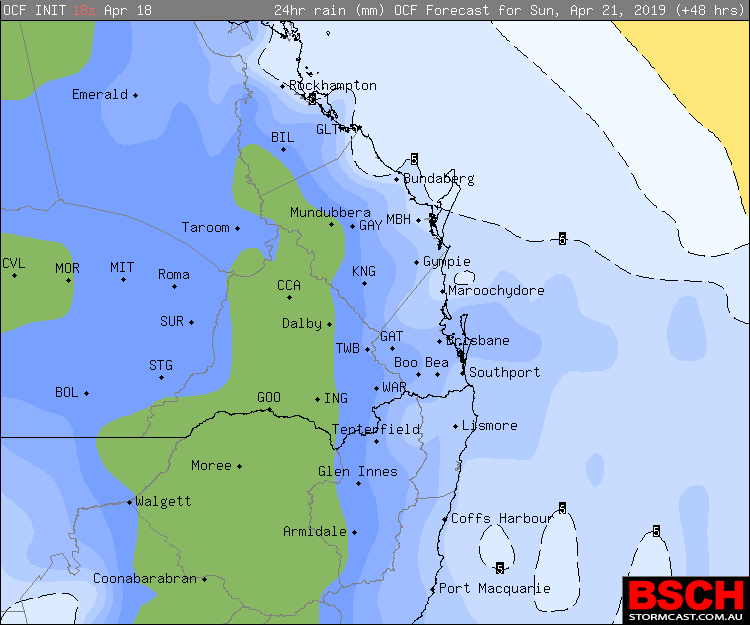 There is an Inland system which is expected to develop over South West & Southern QLD on Sunday which may push through on Monday across the Darling Downs – but don’t expect a lot from this. 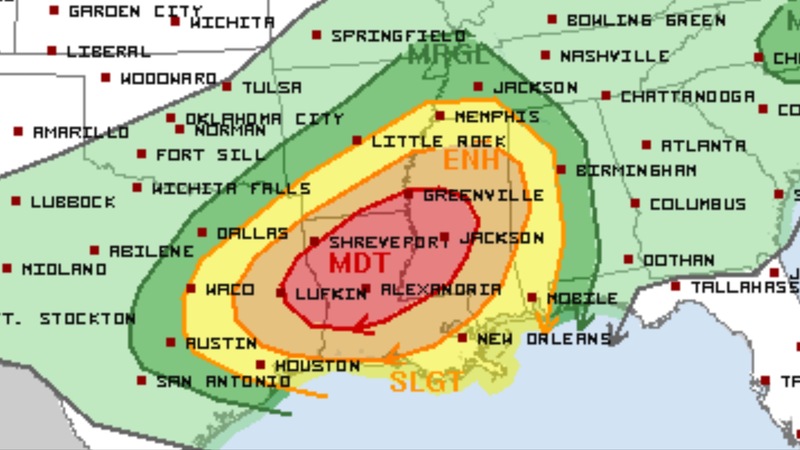 Large parts of Louisiana, Southern Arkansas and Western Mississippi are forecast to be under the pump with a localised tornado outbreak expected during Saturday (local time). 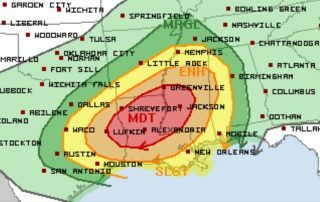 Above image via the Storm Prediction Center showing a categorical Moderate Risk area which could be upgraded to a “High” risk during Saturday’s outlook’s. A low pressure system is forecast to move North East across Texas and through Arkansas into Missouri and the Ohio Valley region. This low is expected to have a strong surface trough extending out to the East from it which will combine with a vigorous upper level system and potent moisture injection through areas South East of the system across Louisiana, Eastern Texas, Arkansas and eventually Mississippi, Alabama and surrounding States during Saturday and into Sunday. This combination is likely to produce potent instability and very strong wind shear which will essentially mean almost every cell that develops could become a supercell quickly. Storm Prediction Center Tornado Risk showing a 15% contour (very high) and a very large hatched area (indicating strong tornadoes). Models are keen on activity developing over Far Eastern Texas early in the afternoon before moving into Louisiana where activity is forecast to strengthen. This is where it gets ugly. 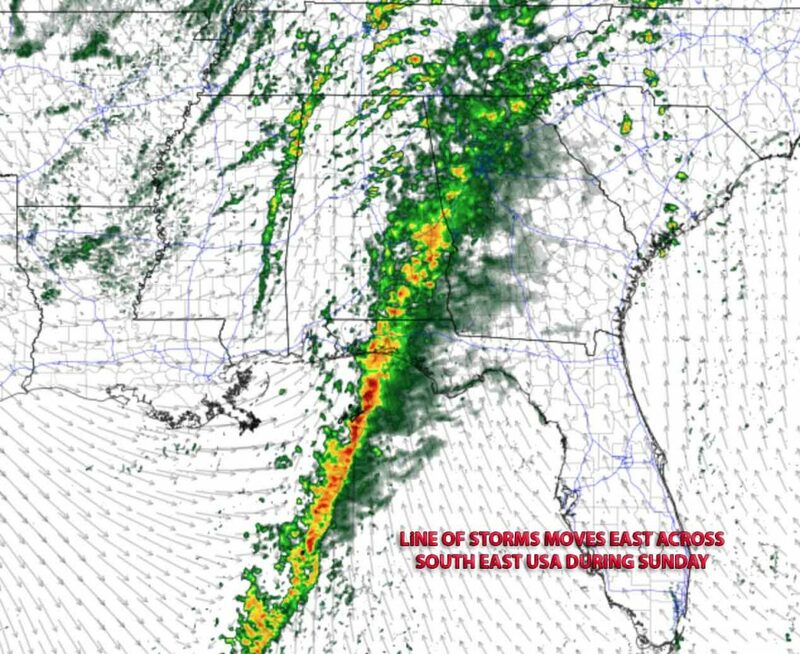 Looking deeper into models, it appears as though a line of potent supercells are expected to move East across Louisiana and Southern Arkansas in the South East quadrant of the low. 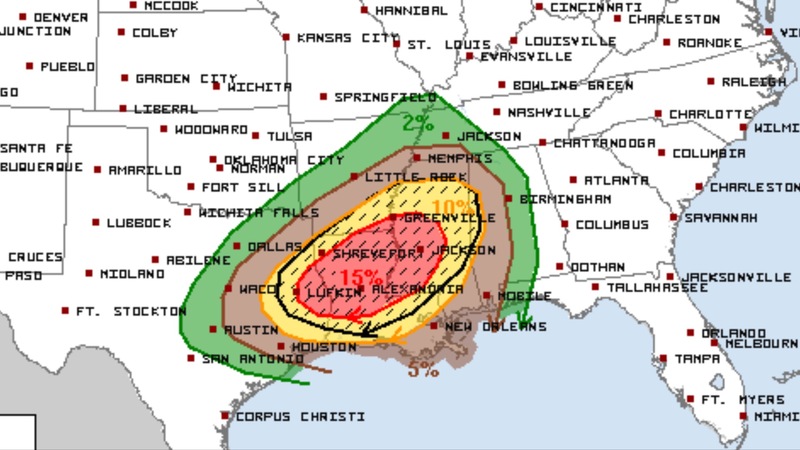 Wind shear will allow virtually all of these cells to become tornado warned with a “likely” risk of several tornadoes occurring across Louisiana and Southern Arkansas, and some of these almost likely to become strong and long lived. There is every chance that this could end up being a very localised major tornado outbreak across the region. As a result of that, there is every chance that the Storm Prediction Center “could” upgrade to a high risk which is fairly rare – only one or two happen per year at the absolute most. As the severe weather moves East, its forecast to consolidate into an extensive squall line where damaging winds will be the main threat. Unfortunately this area from Eastern Texas into Alabama and Western Georgia is heavily populated but also heavily covered by trees and hills. It makes storm chasing very difficult, but living there is even worse as you can sometimes have very little warning of a tornado only a few miles away. 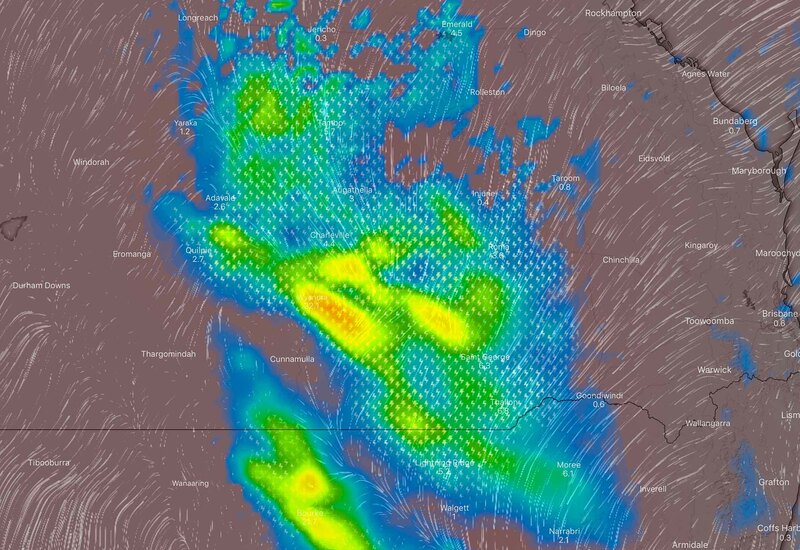 We can only hope that all chasers, residents and tourists remain safe and adhere to the warnings and have safety measures in place for such a volatile day. 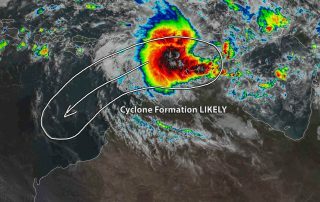 Tropical Cyclone Wallace looks likely to develop either Friday night or Saturday morning North of the Kimberley in WA waters. This will make Wallace the 8th tropical cyclone of the 2018-19 season, very close to what we predicted back in September. A large cluster of thunderstorms is continuing to develop along a weak monsoon located between Australia and Indonesia / Papua New Guinea. This cluster of thunderstorms has consolidated over the past 24-36 hours with a weak tropical low now located (Invest 97S) active. 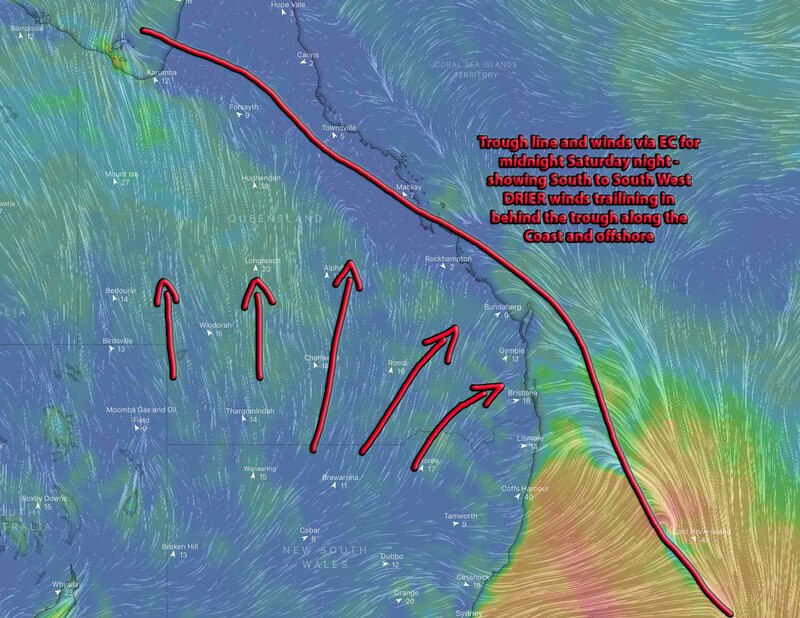 Over the next 24 hours, this tropical low is forecast to become more defined and tighten along the monsoon trough as it drifts West to South West into a more favourable environment. Models remain in agreement that tropical cyclone formation (where Wallace will be named) seems likely either later on Friday or early on Saturday with the system at this stage located over the North East Indian Ocean. From there, models are tending to agree on the strength with the system intensifying into either a high-end Category 2 or low-end Category 3 system. The impacts of Wallace over WA will be highly reliant on what happens with a large high pressure region moving across the Southern half of AUS. A high is expected to move across the Southern half of WA during the weekend, with another high trailing in about 3-4 days later. Wallace is likely to squeeze between these 2 high’s and ‘make landfall’ somewhere over WA, but the timing of that interaction is vital. If Wallace follows the ECMWF track which has a slower moving high, then its not expected to make landfall until its an Ex-TC which could be anywhere from Exmouth to Perth down the West Coast. If Wallace follows the GFS track which has a slightly faster moving high, then the channel between high’s which Wallace can turn towards the Coast will happen sooner and this could pose a threat for areas from Shark Bay to Karratha which would also mean Wallace should be a Category 2 or 3 system as it makes landfall, not an Ex-TC. Other models are differing also which doesn’t make the long term tracking any easier.. but we are confined that Wallace will at least be named either Friday or Saturday, and a landfall as either an Ex-TC or TC seems probable at some stage next week. NSW might be having a second taste of Winter again tonight with minimums likely to plummet across the majority of the State once again thanks to mostly clear skies and cold air aloft. 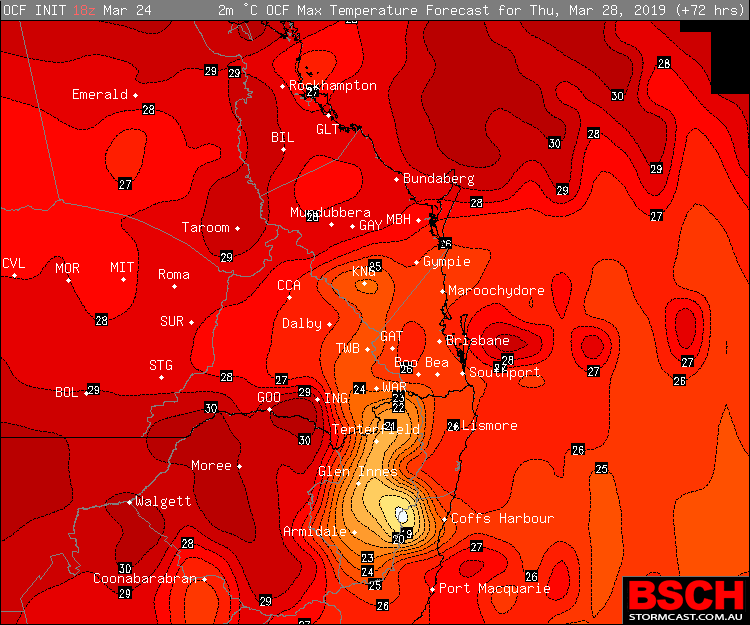 Above image via BSCH / OCF showing minimums for Sunday night / Monday morning. After virtually the coldest March night / morning in 4 years across the majority of the State, and some areas challenging their March minimum records – another round of similar conditions is expected again tonight. This is largely being brought on by an expansive cold pool aloft which is sitting over the State. This very cold air aloft is combining with clear skies to allow maximum heat removal which is forcing temperatures to plummet. 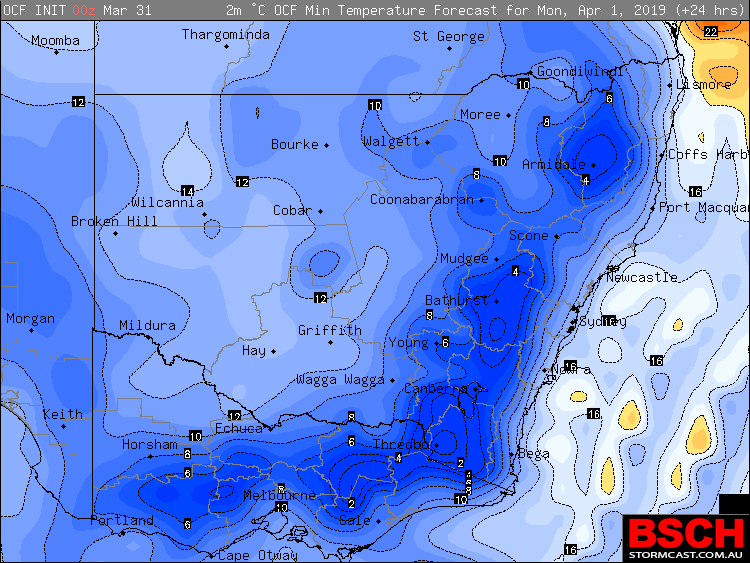 We should see the coldest temperatures along the Ranges with frost being possible along isolated parts of the Northern Tablelands and more scattered parts of the Central Tablelands and Blue Mountains. These areas are likely to drop below 4ºc once again and may even nudge 0ºc (about 1-2ºc colder than last night). 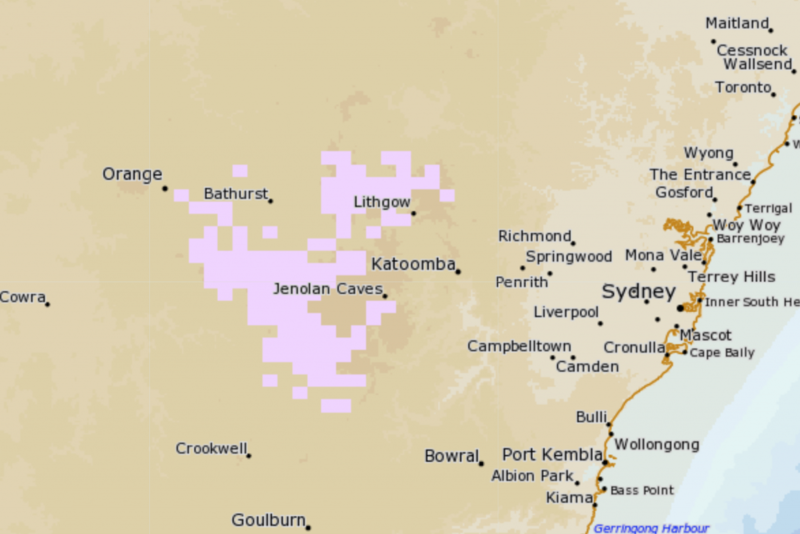 The absolute coldest temperatures will of course be over the Southern Tablelands and elevated parts of the ACT, but cloud cover may prevent frost from occurring – and temperatures may drop early across these areas before cloud increases later on. Along the Coast (mostly through areas North of Newcastle by the looks), where cloud is evasive, we could see minimums of up to 6-8ºc below average, even for April standards. However areas South of Newcastle around Greater Sydney and the Illawarra in particular, below average minimums are expected but not quite as cold as last night. 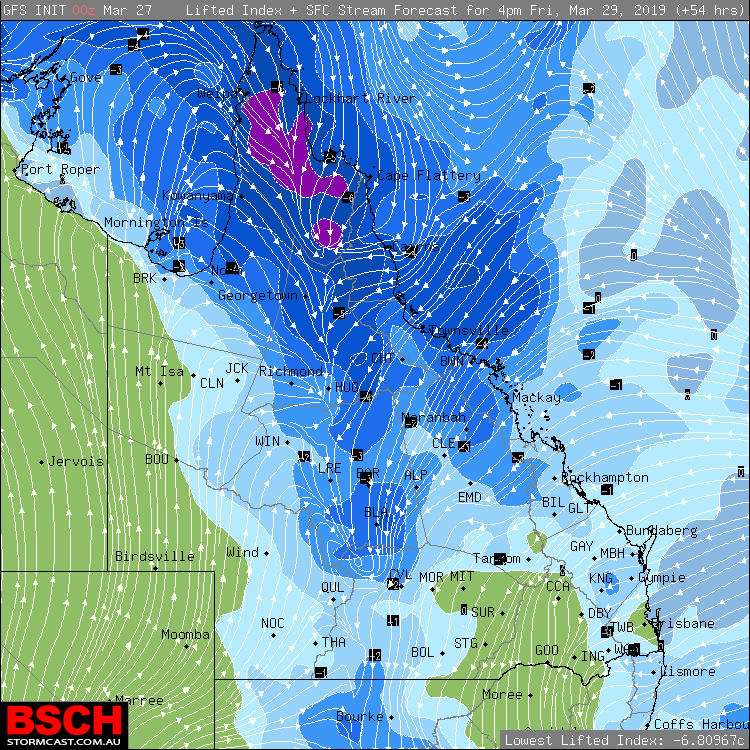 Forecast cloud cover by Windy (EC model) for Monday morning showing large areas of clearing over the Ranges and Northern parts of the State. 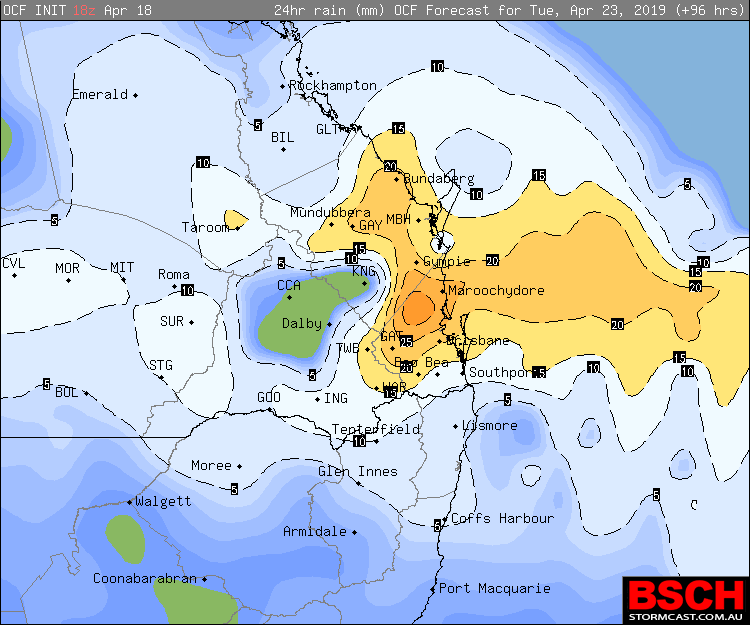 Showers, rain areas and storms are dominating Eastern QLD through Sunday thanks to a trough drawing in high levels of moisture and instability. Behind this trough though, much drier and colder South Westerly winds are blowing in – teasing with the first hints of Winter being just around the corner. 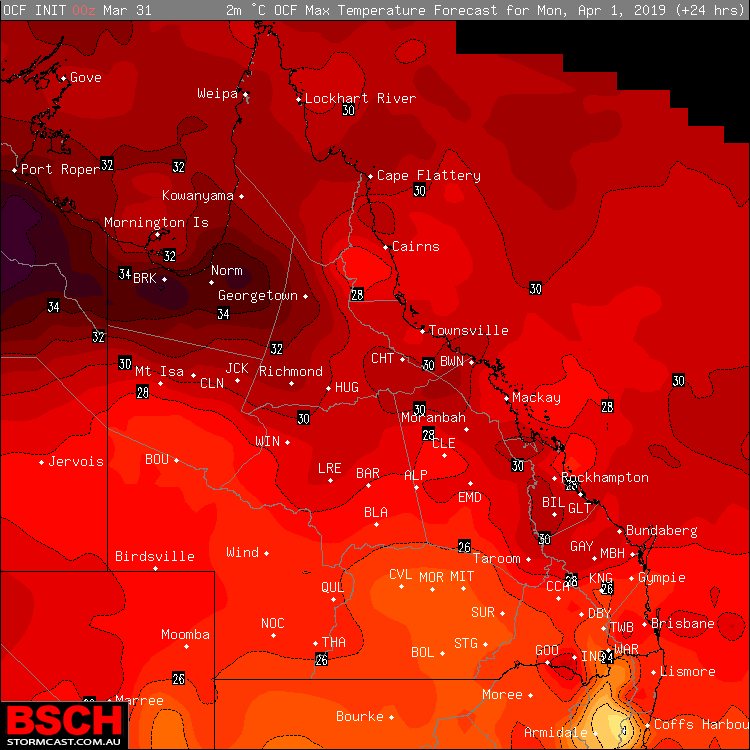 These winds are expected to cut the humidity and with the combination of cold air aloft and clear skies, temperatures should plummet across the majority of the Southern half of QLD. 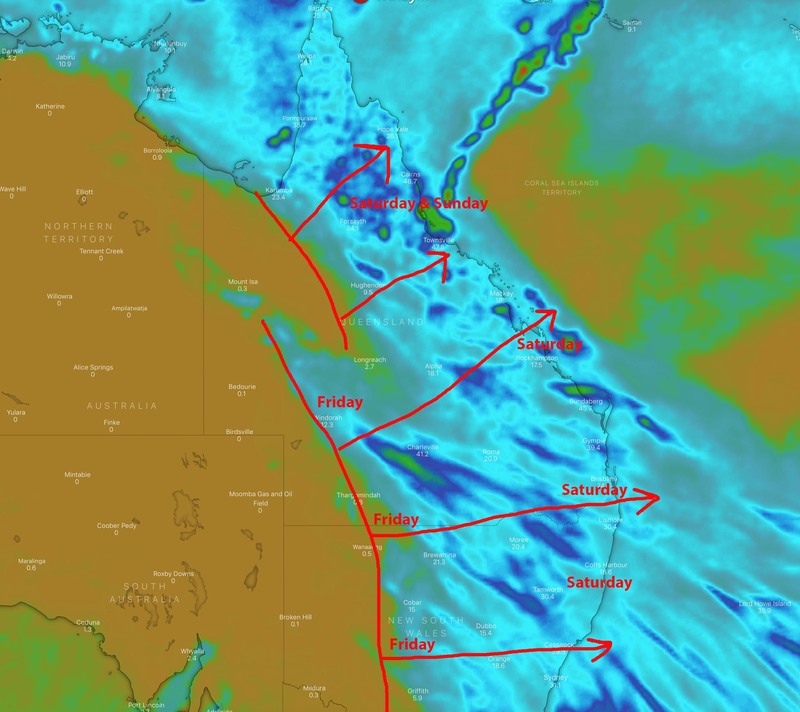 Trough line marked offshore and along the Coast with winds coming in behind it from the South to South West – these are drier winds. 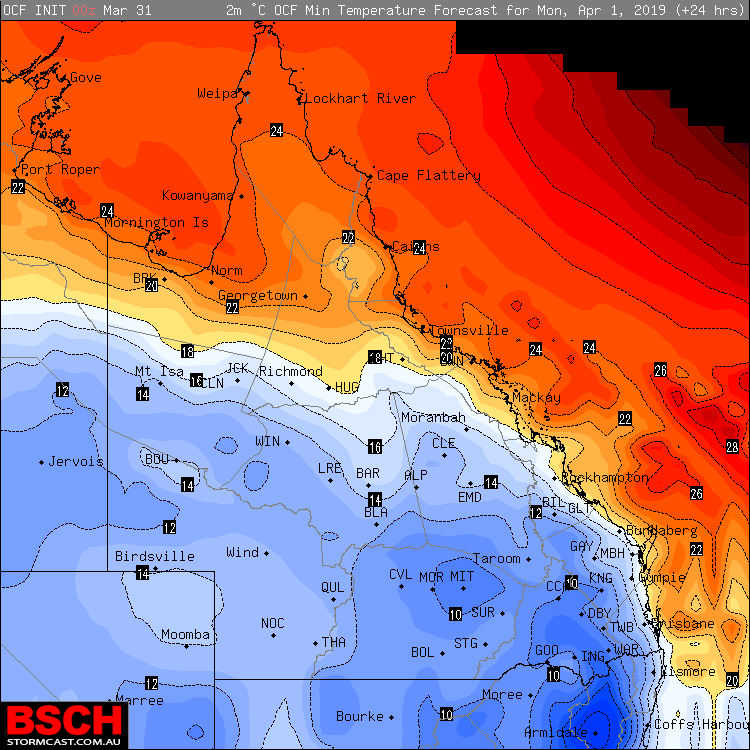 Overnight Saturday night into Sunday morning, temperatures to drop to as low as 5 or 6ºc over the Granite Belt, single digits over the Darling Downs and maybe even below the teens across Central QLD. These temperatures, whilst not being totally uncommon for this early in the “cooler” season, will still be around 5 to 8ºc below average for this time of year. 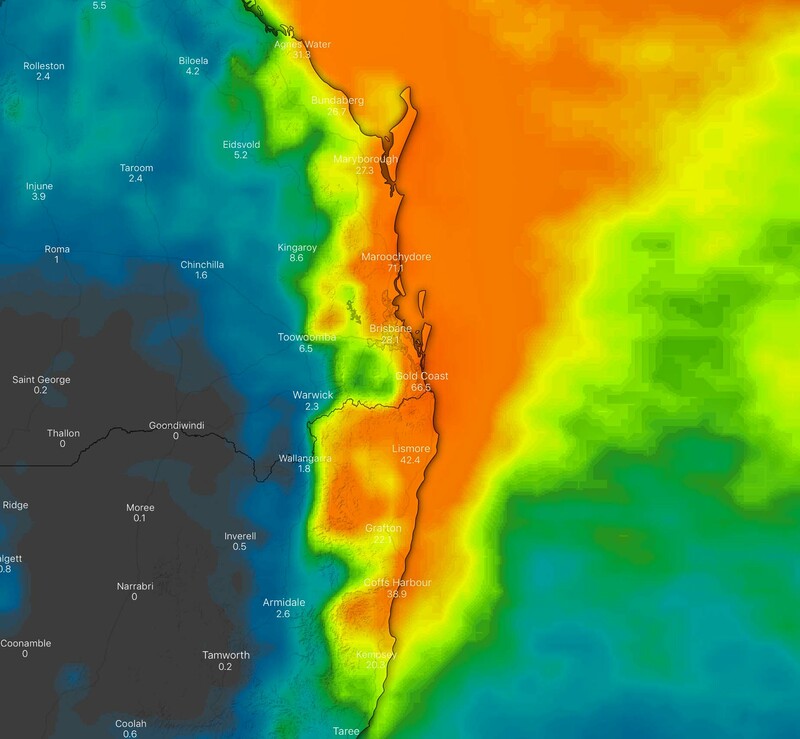 Closer to the Coast between Hervey Bay and the Gold Coast, minimums should bottom out in the mid teens which is around 4ºc below average for this time of year. During Sunday, whilst maximums should climb back up into the high 20’s or low 30’s for most areas – the big difference will be the lack of humidity. 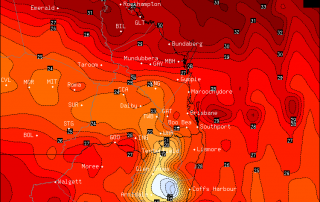 Humidity levels within 20-30km of the Coast way remain elevated – but these areas should also see cooler temperatures than those further Inland. Anywhere more than about 25-30km (as the crow flies) from the Coast should see humidity levels drop into the 30’s and 40% range (which is very low for 27-28ºc). As the week progresses, maximums will remain similar but the humidity will start to creep back in gradually. 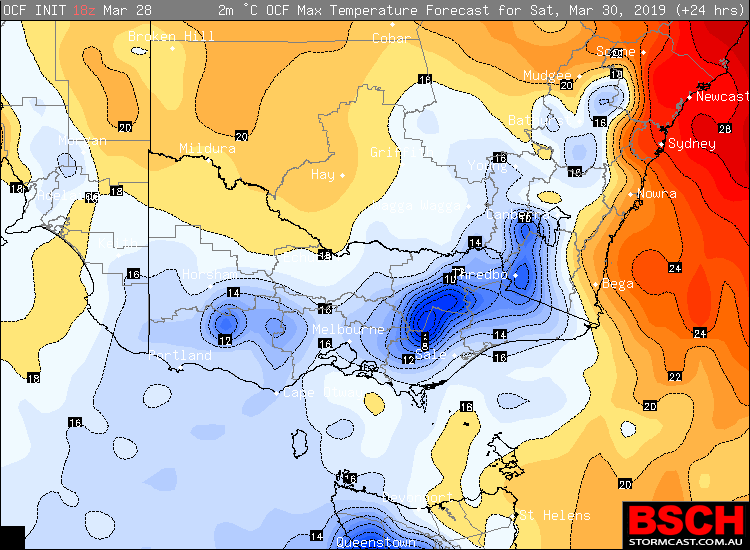 Back across Southern Inland QLD, maximums will be heavily influenced by the South to South West cooler flow, with temperatures potentially sitting at around 6-8ºc below average and in the low to mid 20’s all day. 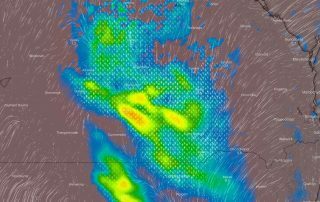 Snow, rain, hail and significantly colder weather is set to spread across VIC and mostly Southern NSW across this weekend as a cold front and upper level cold pool sweep the region. Above image – temperatures at 17,000ft showing the cold pool over VIC and Southern NSW (they are NOT surface temperatures). 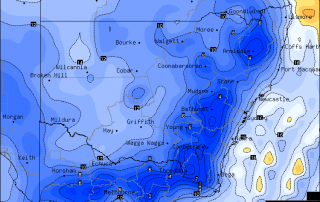 A cold front is set to move across VIC and Southern NSW during Friday. This cold front is likely to produce rain and storms across VIC and Inland NSW on Friday and Eastern NSW on Saturday – BLOG HERE. 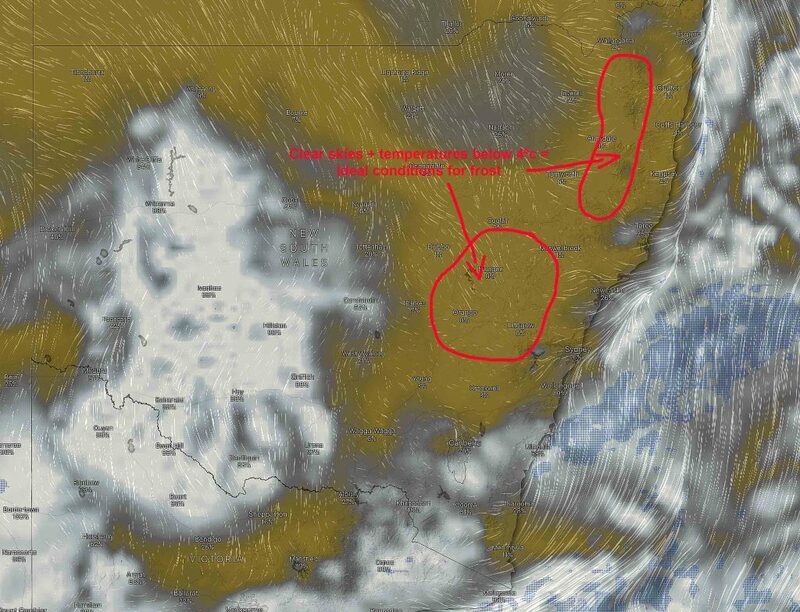 Behind this front though, an intense cold pool is expected to trail in and move over VIC and Southern NSW. This cold pool is likely to combine with increased moisture from the South West to produce scattered showers and some light rain areas with pockets of small hail being likely – especially directly under the cold pool. Overall, rainfall totals should be on the lighter side courtesy of the faster moving nature of the cells along with the sporadic nature of them. The biggest things to note will be the very cold temperatures compared to the rest of the Season. 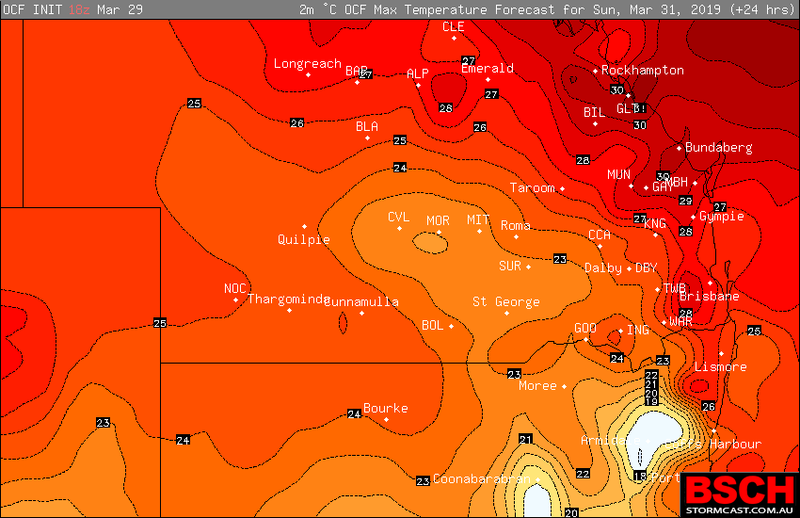 Maximums across VIC in particular are expected to be well below normal for even late March standards. 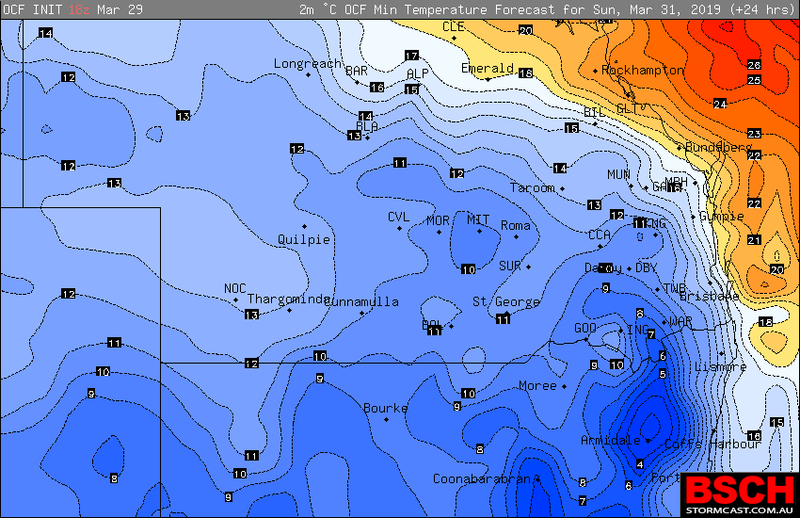 Melbourne is going for just 15ºc which will be the coldest March day in 41 years. Mildura is heading for just 18ºc – a 12ºc drop on Friday. 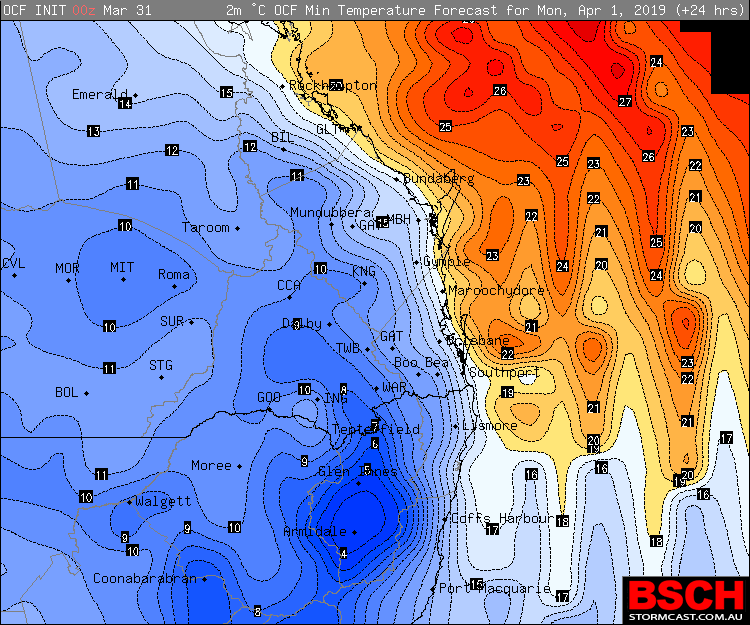 Places like Bendigo and Ballarat may be up to 15ºc colder than Friday with maximums failing to reach the mid teens. 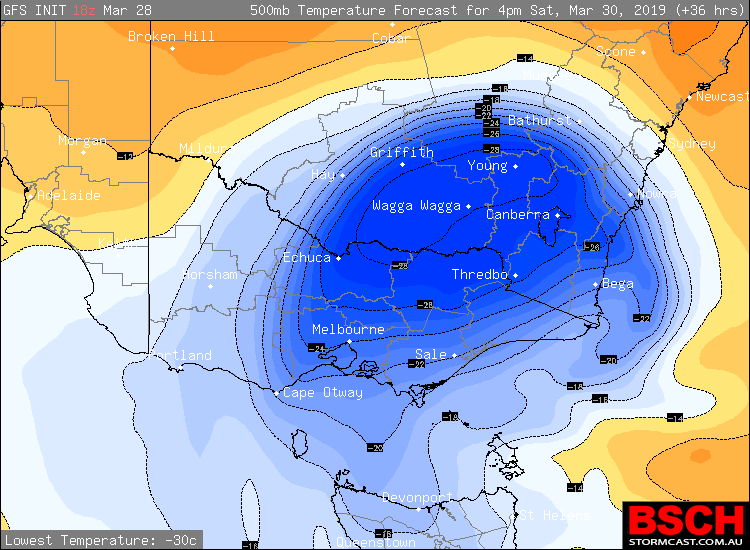 Across the Alpine resorts, maximums may struggle to get above 0ºc during Saturday and barely any warmer on Sunday. Speaking of the Snowy Mountains, snow is expected to start falling during early Saturday and increase as the day progresses, peaking overnight into Sunday morning. Conditions should then slowly clear during Sunday. 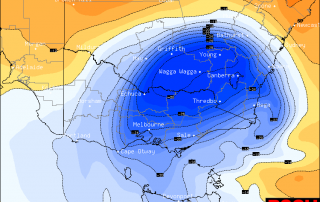 Falls of up to 10cm are expected over the Snowy Mountains, but if any locally heavier cells move through during the peak snow window, then we could see 15-20cm quite easily given the strength of the cold pool. 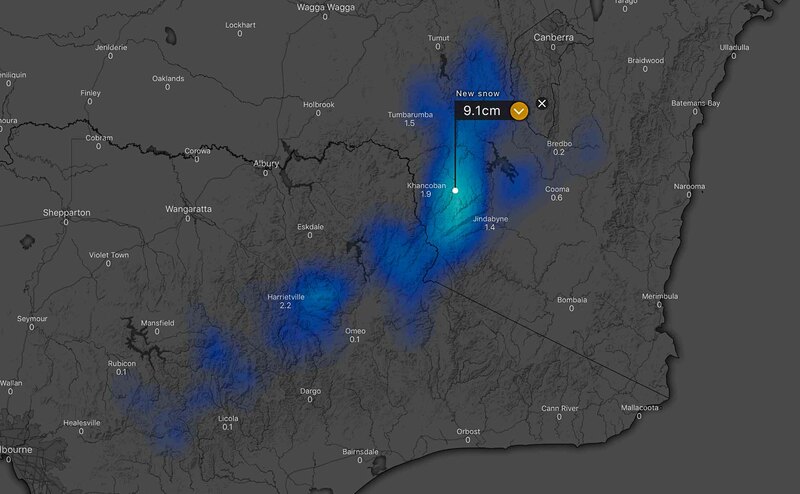 The cold pool will likely move over the Central Tablelands during Sunday morning where temperatures will be cold enough for snow, but moisture levels will be questionable – so at this stage, we don’t expect snow over the the Central Tablelands.